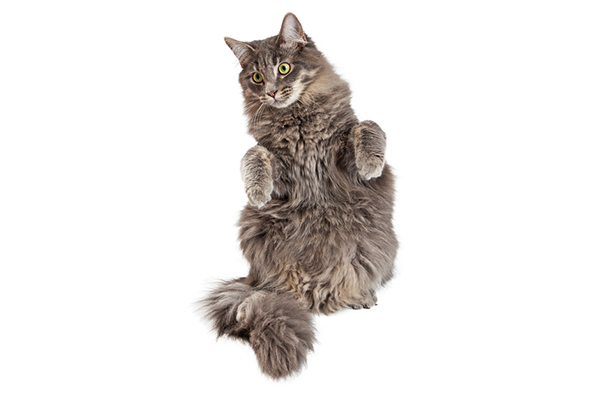 We’ve all caught our cats in the act of standing upright on their hind legs like some peculiar mix between a meerkat and a marionette puppet — but why do our usually regal and poised felines insist on carrying out this curious behavior? Is there any science behind it? And what’s really bubbling in the brain of a cat standing up on his hind legs? Let’s dig in and find out (and watch some fun videos in the process!). As funny as a cat standing up on his hind legs looks, the origin of the move is serious business. When cats feel threatened by a devious predator, they will often attempt to make themselves appear as large as possible. You guessed it: Perching up on the back legs is part of this survival tactic. In extreme cases, you might even see cats shuffling along sideways while in this upright position — which is another attempt to look as large and fearful as possible. Do not mess with a cat standing up on his hind legs. A cat standing on his hind legs. Photography by EEI_Tony/Thinkstock. Another way to get your cat to perfect the two-legged stance is through the tried-and-tested tactic of tempting him with treats. Even the most reserved cats can be coerced into propping themselves up on their back legs when the rustling sound of the treat bag is in play. Let’s be honest, when cats decide to get up on their hind legs, they totally look like meerkats — although technically meerkats are part of the mongoose family. So, let’s just chalk this similarity up to being another curious kitty quirk. Munchkin cats tend to stand on their hind legs a lot. Photography © Seregraff | iStock / Getty Images Plus. 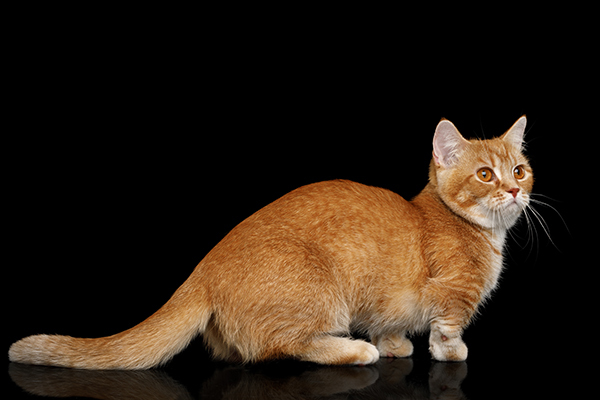 Munchkin cats are born with short, stumpy legs due to some sort of genetic mutation science. As a consequence, these squat kitties can frequently be found standing up on their back legs. It’s all about the low center of gravity, you see. 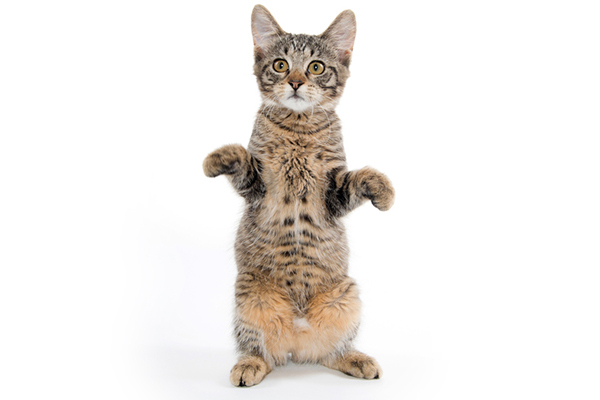 For some special-needs cats, learning to stand and get about on just their hind legs isn’t just an eye-catching move — it’s a necessity. A couple of these kangaroo cats, as they’ve been dubbed, are stars and advocates on the social media scene. The grandiosely titled Lil Bunny Soux Roux was born without her front legs but has become an Instagram sensation thanks to pictures of her hopping around like some sort of marvelous kangaroo-Tyrannosaurus-rex hybrid. 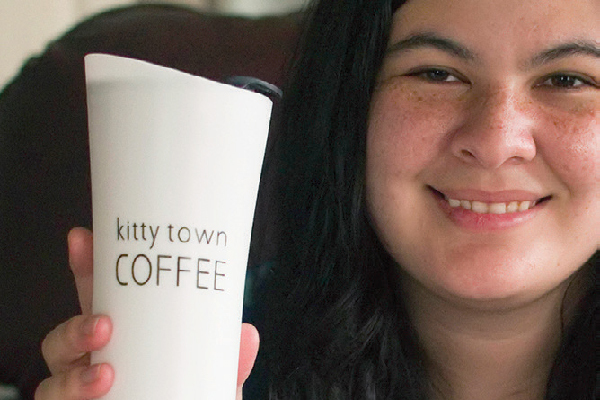 Roo is another social media celebrikitty who’s all about owning his kangaroo-cat status. He was born with radial hypoplasia, which stopped his front paws from growing and developing properly — but these days he’s more than happy hopping around for his legion of fans alongside his similarly famous kitty sister, Venus the Two-Face Cat. Cat Spraying — Why Does It Happen and What Can You Do? Phoebe was a ferrell newborn when we found her, a few days old. She was born 4/2014. Periodically I think she wants something when she does this. My mom got a video of her doing it. But, we still don’t know what it is. Don’t know what kind of cat she is either. ? tabby / tiger markings with a white bib and paws. She’s about 12 to 14 lbs, not fat, but big. She is definitely the Alpha and comes out first to explore strangers. She’s very smart, and comes to her name. Anyhow, she stands on her hind feet and looks at something(don’t know what she’s looking at)then stretches her front paws up into the air, then brings them together in a praying position and then down an inch or two in front of her. She repeats that motion over and over into a prayer position. I want to respond, but, I don’t know what she is doing. She looks like her movements are so purposeful. Help me. I have two cats almost a year old, the one cat is female you hardly even know she is around she is a good cat. now the other one is male he is a total different story, I say he has ADHD he is so busy body and hiper, but i have trained them since birth not to get on the kitchen table and the kitchen counter top, well he listened for a minute and now when he sees me he runs and jumps on the table and counter tops and i have a spray bottle i spray him with well he does not care he will stand there and look at me until he is about soaked then he will jump down, it seems he does these things for spite makes me so mad, does anyone know what i can do to get him to listen to me with the rules expecailly not on the tables? My beloved Crystal use to get on her hind legs and use her front paws to open the bedroom door, it was a round knob so she had to keep turning it with her front paws until it opened. She was very smart and lived to age 21. Possum, our tortoiseshell Burmese, swings paintings to get our attention. She stands on the back of the couch, on her hind legs, steadies herself with her left paw against the wall, and pushes the corner of the painting with her right paw. Works every time since we don’t want the painting to fall off the wall! Our Guy Squeaks often stands on his back legs and “peddles” with his front legs to gain our attention. Crazy as it sounds he has always done it.